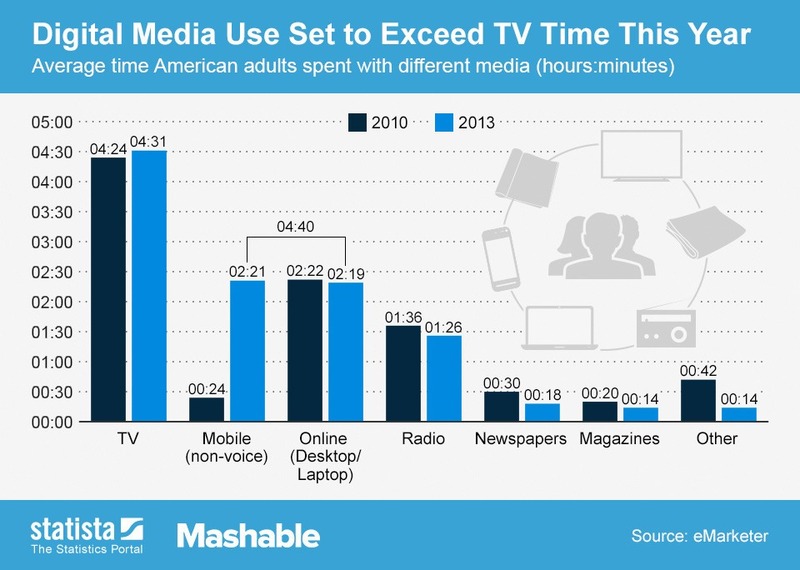 According to last Friday’s article from Mashable (based on data from eMarketer), Americans are consuming more digital media than TV for the first time. The biggest jump in digital consumption comes from people using their smartphones to connect online. People are emailing coworkers while they are out to eat, reading online restaurant reviews while sitting on a park bench, and tweeting photos of live concerts, like at Lollapalooza this past weekend. On one hand, this changing media use affects Corona’s clients. Specifically, the marketers we work with constantly have to adapt to changing media trends. Marketers have the difficult job of understanding these new communication channels, and look to people like us to give them a solid foundation of understanding their target audiences. On the other hand, changing media use affects the way we conduct research. For example, land line phones are becoming scarcer as people are transitioning to solely using their cell phones, which affects the ways we conduct phone surveys. In fact, it even affects who responds. Not surprisingly, those more likely to use a land line tend to be older than those using a cell phone. Sometimes these changes, such as decreased land line use, make our jobs a bit more difficult in terms of connecting with the right people. On the other hand, increased mobile use opens new doors for us. The future of research using mobile offers a new venue for participants to share their experiences as they engage in them, using video, photo, and other capabilities. This Fast Company article talks about how sometimes consumers aren’t able to explain why they make a decision, because the factors controlling that decision lie in their subconscious. When we can capture research participants engaging in an activity, we get a truer result than if they were to explain their experience. New research methods are opening doors into new insights, and this evolution rides on the wave of advancing technology.